Caramel – Pecans – Pretzels – Chocolate = YES please! This no bake cookie recipe, Caramel Pecan Pretzel Bars are perfect any time of year! 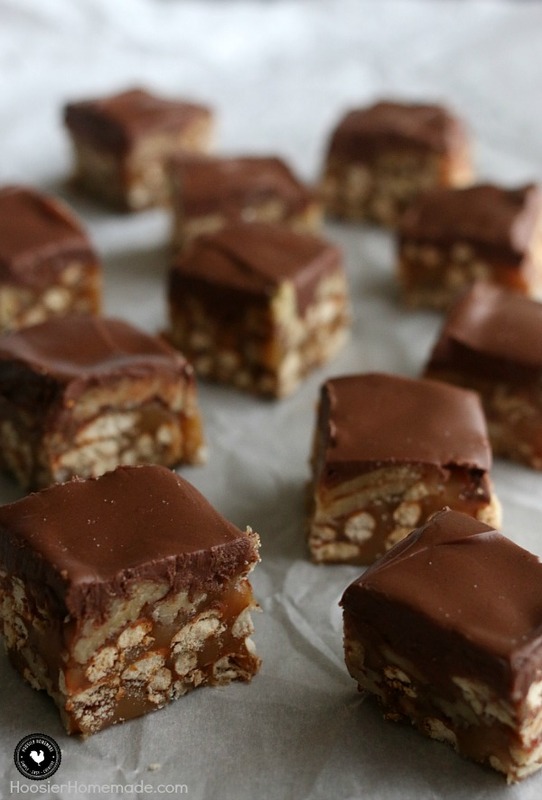 They are easy to make and one batch makes a enough to enjoy and share! They are a MUST to add to your Holiday Baking list! 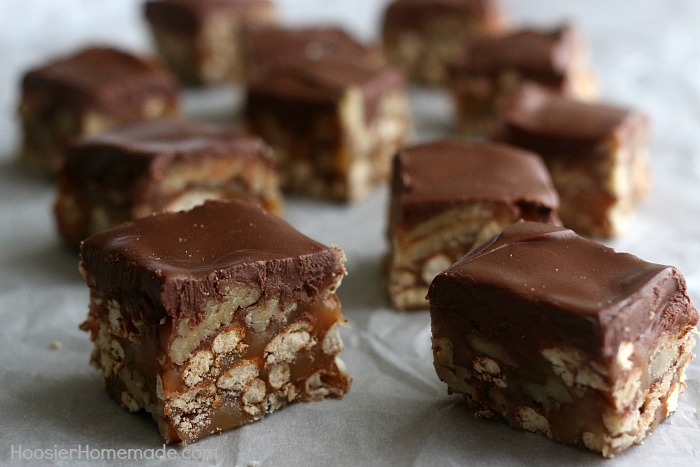 I don’t know about you but I have never met a no bake treat with caramel and pecans that I didn’t absolutely love. And let me tell you – these are SO delicious! Now don’t get me wrong, I love baking and especially for the holidays. But when I can keep it simple and whip up a batch of these Caramel Pecan Pretzel Bars in about 15 minutes, it’s a win-win! Earlier this week Doug and I cooked dinner and served our praise team at church. Every week they bless us with music, and serving them dinner after their weekly practice is the least we can do for them. Because we are transporting food, we like to keep it simple, so we served Slow Cooker Chili, Taco Soup and Baked Potatoes with all the toppings. Then for dessert – these Caramel Pecan Pretzel Bars and everyone’s favorite, 3 ingredient Cheesecake. These bars were an absolute favorite. I heard “oh my” and “oh wow” and even “I could eat these for dinner.” They are definitely praise team approved. Like I said, these Caramel Pecan Pretzel Bars are super easy. In a 13×9 pan that is lined with parchment paper or foil and buttered, you add pretzel sticks (I broke them into pieces) and toasted pecans. I added about a tablespoon of butter to a skillet and lightly toasted the pecans for a few minutes, just until you can begin to smell the pecans. And then added them to the pan with the pretzels. After that, the caramel is cooked on the stove. A combination of Karo light corn syrup, brown sugar, butter, sweetened condensed milk and salt are cooked until 240 degrees, which is the soft ball stage on your thermometer. Cooking candy can be intimidating, it was for me for a long time. But in fact, it’s really easy if you have the proper equipment. A long candy thermometer is the key. I add it to the side of the pan before I begin cooking and watch the temperature closely. After the caramel is cooked, remove from the heat and add the vanilla. Then pour the mixture (carefully because it’s VERY hot) over the pretzel mixture. Let the bars set on the countertop for about 30 minutes or until they are mostly set. Then melt the chocolate chips and shortening in the microwave and frost the bars. Leave them on the counter until they are set, then remove the parchment paper and cut the bars. Using a buttered knife worked best to cut them. They are a bit sticky when you cut them, but they are SO worth it. Last year I shared a Triple Nut Tart made with 3 kinds of Fisher Nuts – pecans, walnuts and almonds and the addition of Karo light corn syrup. Over the past year, I have shared several recipes using Fisher Nuts. I love baking and cooking with Fisher Nuts because it is one of the only brands of recipe nuts entirely without preservatives. Connect with Fisher Nuts for more delicious recipes on their website, Facebook and Pinterest. Caramel - Pecans - Pretzels - Chocolate = YES please! 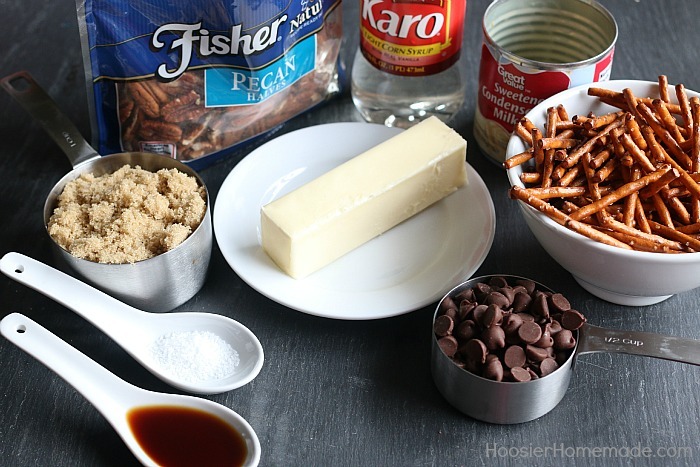 This no bake cookie recipe is perfect any time of year! It's easy to make and one batch makes a enough to enjoy and share! In a medium microwave safe bowl, combine the chocolate chips and shortening. Cook for 1 minute, stir and continue cooking for 30 seconds. Stir until chips are completely melted. could you sub a different nut?? maybe a cashew?? if so would you still roast in pan? Hi Tracy, sure you can use cashews, really any nut you like. The toasting would depend on the nut and the flavor you want. I don’t think you would need to toast cashews. How long do these keep? Can i make these ahead and freeze them? They look so good! Hi Cindy, I have not tried to freeze them. I would think they would be fine to though. They will keep at least a week in an airtight container in the refrigerator. I want to make these for a potluck party. How many people do you think this would serve? The recipe makes 6 dozen! Hope this helps! How many 13 x 9 pans does this recipe use? Or do you cut one pan into 72 pieces?! Hi there, yes just 1 pan, the pieces are small. You can certainly cut them any size you like. This sounds amazing! Perfect for holiday cookie exchanges.